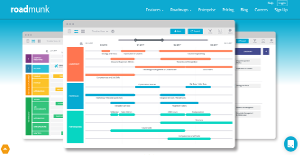 Roadmunk is a roadmap application for product management and marketing teams that helps them manage their product launch campaigns, and provides an array of advanced, flexible, and easy to use features. The system is collaborative, intuitive, and boardroom ready, but its biggest quality is scalability, as businesses of different sizes get to use it in a brand-specific fashion. Roadmunk was initiated in 2013. The company is based in Canada and assists both local and international brand managers to create and execute successful roadmaps. Currently, the system is used by prominent performers from different industries, including names such as Slack, Amazon, Citibank, and many others. Building collaborative and attractive road maps is as easy as importing CSV data from Excel or Jira and, if you prefer create your own road maps from dozens of pre-built templates. All you product portfolio can be visualized, shared, and data integrated with Jira. It also lets you print your roadmaps, share them as links, or export them in PowerPoint or PNG. You have plenty of customization options with several advanced filters. This lets you design your plans just the way you want and that too with a lot of flexibility and ease. Presenting your product to your clients is crucial. Raodmunk allows you to see multiple views of the same data. You can present the same data to different teams in completely different ways. These templates are designed to help the end users extract the most relevant information easily. When you share your plans with your team or clients, you can also comment and chat. You can mention a particular team member as well. It’s more like a social media post so it’s a lot of fun working with the software too. Collaborating is also quite smooth. You can set permissions for each team member. There are three permission settings available so your documents and files are well secured. If you are interested in Roadmunk it might also be sensible to examine other subcategories of Best Product Lifecycle Management Software - PLM gathered in our database of B2B software reviews. It's important to note that almost no app in the Product Lifecycle Management Software - PLM category is going to be a perfect solution that can fulfill all the goals of different business types, sizes and industries. It may be a good idea to read a few Roadmunk reviews first as certain solutions may dominate exclusively in a really small set of applications or be designed with a really specific type of industry in mind. Others might function with an intention of being easy and intuitive and as a result lack complicated functionalities needed by more experienced users. You can also come across apps that focus on a large group of customers and give you a powerful feature base, but that in most cases comes at a more significant price of such a software. Be certain that you're aware of your requirements so that you choose a solution that provides all the functionalities you look for. We realize that when you make a decision to buy Product Lifecycle Management Software - PLM it’s important not only to see how experts evaluate it in their reviews, but also to find out if the real people and companies that buy it are actually satisfied with the product. That’s why we’ve created our behavior-based Customer Satisfaction Algorithm™ that gathers customer reviews, comments and Roadmunk reviews across a wide range of social media sites. The data is then presented in an easy to digest form showing how many people had positive and negative experience with Roadmunk. With that information at hand you should be equipped to make an informed buying decision that you won’t regret. What are Roadmunk pricing details? What integrations are available for Roadmunk? If you need more information about Roadmunk or you simply have a question let us know what you need and we’ll forward your request directly to the vendor.